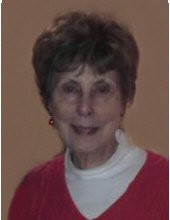 Jacqueline “Jackie” Yost Cassell, 82, of Middletown, died Tuesday, March 19, 2019, at home. She was born in Hamilton on November 16, 1936 to parents Herbert and Evie (Sparks) Robinson. Jackie is survived by her children, Brian (Dax) Yost, Shelly (Scott) Sandmann, Ellen (Sam) Nelson & Becky (John) Mirlisena; brother, Dale Robinson; ten grandchildren; nine great grandchildren; and five great great grandchildren. She was preceded in death by her parents and brother, Mickey Robinson. A Gathering of Family & Friends will be held Tuesday, March 26, 2019 from 12:00 noon to 2:00 pm at Wilson-Schramm-Spaulding Funeral Home, 3805 Roosevelt Blvd, Middletown. To send flowers or a remembrance gift to the family of Jackie Yost Cassell, please visit our Tribute Store. "Email Address" would like to share the life celebration of Jackie Yost Cassell. Click on the "link" to go to share a favorite memory or leave a condolence message for the family.